Our beautiful planet is being continuously exploited and destroyed by mankind! Everything has its price. Nothing has any value. This is a disgraceful fact. We do not even imagine the comprehensive consequences. Life knows no recurrence. War is a choice and Peace is a choice. We have to get out of this path of unstoppable greed! Transformation comes from willingness and we must make necessary changes NOW! Soon a time will come when the majority of mankind, become aware of the immense spiritual power that lays unused in our hands. That we alone, can change the quality of life. Accepting the facts, that peace, compassion, and freedom is essential, today more than ever before. Life has become so out of balance, that we consider these extreme aberrations as normal. Our expectations have been crushed so many times, that we have forgotten how to love and trust. The widespread corruption and the decay of values can be clearly seen.The protests have ceased to be effective enough. In many countries, human beings are oppressed and still treated as chattel. The majority of current politicians are motivated only by a lust for power and all-mighty God of money. Our beautiful planet is being relentlessly exploited by mankind! This is a sad and disgraceful fact! The present situation on the Earth is close to destroying a majority of mankind! Several irresponsible fanatics are even planning it. This madness, this infectious condition of violence, must stop! If we allow a few maniacs for making irreparable damage to our planet, which is only home to countless inhabitants, then we are really foolish, indeed! The entire atmosphere is filled with such a violence, terror, and darkness, that it looks like a thick, black murky sea of ugliness. The occurrence of the human race on this planet was closely related to caretaking for the planet Earth. Care-taking! What does that mean? If someone is caring for you, they do this with love, consideration, and respect! And what care do we give to our home planet? The present situation has very little to do with the Creation. We have brought this to us by our own thoughts and actions. We live in a world of matter where the events happen through our own past and present volition. Therefore, by our free will, we reap what we sowed. Human acts of anger, violence, and penetration have a fatal influence on the very land and soil from which we all survive. Arrogant scenarios on life “After Earth” are already prepared. No wonder we fear of an Apocalypse. If the human mind is choosing the path of physical demolition and unless we begin to cooperate, nobody can save us. We have a free will to create our own conditions and live out what we have created! Very little time for change is at our disposal and further procrastination leads us to planetary chaos. The demolished ecosystem will find a new balance, without us. Earth is billion years old majestic structure and needs no human assistance to be saved since its existence is subject to higher laws of the Universe. Perhaps this is the last tryout in the evolution of mankind as a species and we do not even imagine the comprehensive consequences. Life knows no recurrence. Any species that wasted opportunity, awaits the same destiny – global extinction. War is a choice and Peace is a choice. Transformation comes from willingness and we must make necessary changes NOW! A man should not think of himself alone, but rather be seen as co-creator of a Happy Earth. What Earth itself has created, is possible further to develop, not only through our Techno-science as the only worshiping truth but through symbiosis with all its inhabitants. We must begin to realize that we are only hosts here, created by the warm embrace of our Mother-Father Earth as caretakers and co-creators. There is a New World waiting to be born. By the power of our minds and love in our hearts, it is possible to achieve this expansion. We stand on the brink of glorification or possible disaster. We must choose between altruistic or arrogant behavior. Mankind needs to resume responsibility as Caretakers of the Earth. For we were chosen a long time ago for this mission, to develop the full expression of love and compassion, so that the Earth and mankind, would raise in the magnificent glow of entire Universe. The main purpose of our community is to inspire others with awareness of Life Beyond our tiny planet! The human origin lies far beyond time and space and our appearance on this planet is based on Great mysteries beyond the perception of mortal personality. Love is an actual energy substance of which the entire Universe is made of and held in place. Without it, all life would vanish. And love for all living beings is the primary obligation for mankind. With physical participation and allegiance on the location where you reside, so much can be done! To achieve the synthesis of two major directions – political and spiritual – requires commitment and cooperation. If your bad conscience has been aroused, then respond and react, but try to be prudent with convictions. There is a place for everybody and our Mother-Father Earth is rich and can provide for everyone. The Caretakers* of All Life Upon Earth! WE ARE THE CARETAKERS of Mother-Father EARTH and ALL LIFE UPON IT. This is our destiny and our purpose! Let us pledge our consistent effort to maintain biodiversity and balance back in our domestic surroundings. With commitment, compassion and care let’s make our planet a healthier place to live. JOIN US in cooperation with like-minded people of goodwill, in order to create a critical mass of people needed to fulfill OUR COMMON QUEST! HELP US in SPREADING this MESSAGE ! A CALL ON ALL PEOPLE OF GOODWILL TO SUPPORT OUR ENDEAVOR! We do not receive any funds from the state. This means that PeaceTraveter Association is funding his mission almost entirely by selling artworks at Art of Immanent Spirit – gallery. If you approve what we do, please support us! Every single donation counts and we would like to thank you for every contribution no matter how modest it is. With the art of renowned artist Leonard Rubins, one of the founding members of PeaceTraveling Association, you will get inspirational artwork with a myriad of details, imagination and deep symbolic meaning. Thank you! 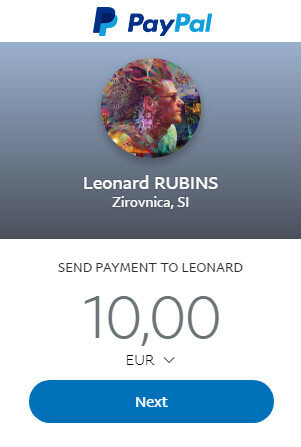 Every donation is awarded in form of DIGITAL ART (free download option) and/or PeaceTraveler Membership ID Card! Different sizes of prints available. Up to 1000 x 800 mm sizes can be sent. (Artwork prints are rolled in a Shipping Tube). Our art is available as: download files (up to 4500 pixels length) and signed art prints (up to 1000 x 800 mm). 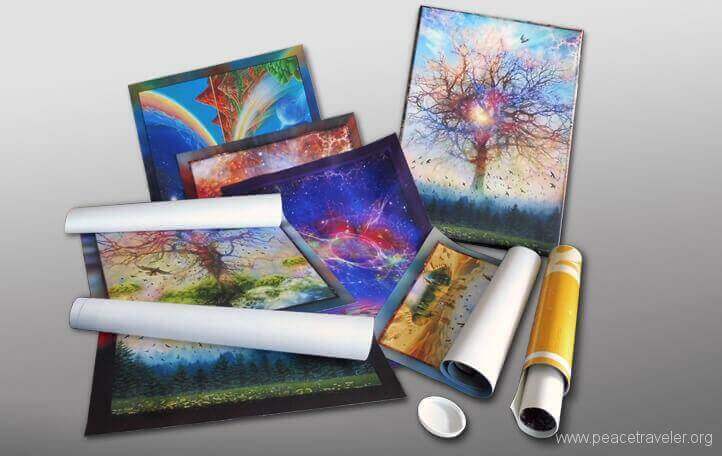 Printed as: Art Photo UV* (glossy), Inkjet UV* prints (matte), Art on Canvas UV*(best option). * UV-resistance.